Firstly, skillet cook the ground hamburger meat until nicely browned and sizzling. Drain and set aside. If you’re up to multitasking, while the ground meat is cooking, throw the cubed red potatoes into a lightly salted pot of boiling water, for a good 8-10 minutes. Once the potatoes are soft to the touch, drain and pat dry. Also set aside. Preheat the oven to 350F. Line one baking sheet with a Silpat mat or aluminum foil. Gently crack open the croissant roll package and line up all 9 dough pieces onto the baking sheet. Set aside while you mix the hamburger filling. Once the cooked meat has cooled, using your fingers (yes, this is very, very messy), generously mix in the catsup (if using). Next, heat up the grated cheese in a micro-wave safe bowl, until melted. Which REALLY means until gooey. Stir the cooked potatoes into the melted cheese. Again, this will be very messy. But fun. Okay, well, I thinks it’s fun, at least. Using a tablespoon, drop up to 2 tablespoons of the potato/cheese mixture into the top middle section of each dough piece (which looks something akin to a pizza slice). Gently press 1 tablespoon of hamburger meat into each mound of potato/cheese. 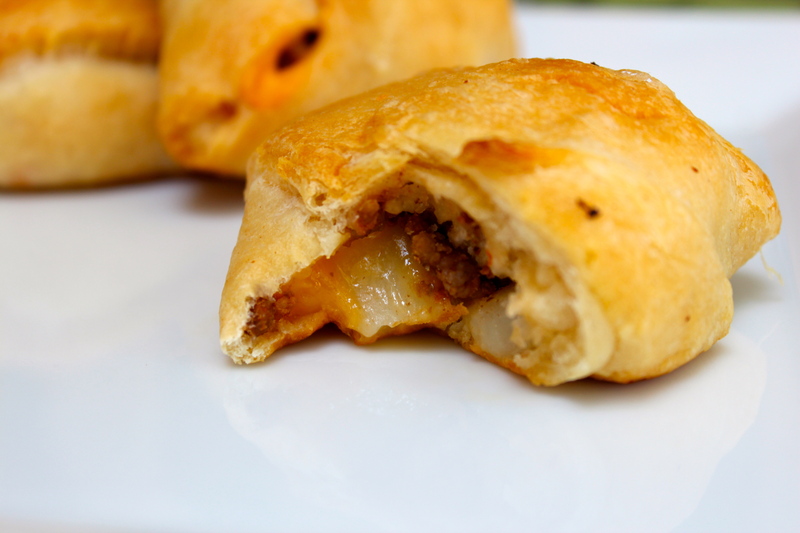 Once each roll has been garnished with it’s potato/cheese/hamburger filling, fold each corner flap of the dough pieces, into one another & transfer to the prepared baking sheet. Bake for 12-15 minutes until the Croissants are lightly browned on the edges and an even shade of golden yellow on top. Cool on a wire rack for 2-3 minutes before serving. So. So. Easy. Your tummy will thank you, I promise. « The Stealthy Kitchen Mama Photo-shoot with So Cute Photo!